Strong economic growth in the emerging world is bringing new economic challenges to the forefront particularly for those countries that have recently reached middle income status. More than a decade of robust and sustained economic growth in emerging economies is contributing to a trend of increasing convergence in per capita income with high income countries and the shift of the economic centre of gravity towards the south and east (OECD Development Centre, 2010). These trends also bring new economic challenges to the forefront particularly for countries entering the middle zone of the per capita income distribution. Historically, few middle income countries have been able to enter the group of high income economies. This suggests that, at middle levels of income, economic growth becomes more arduous: on the one hand, these countries have reached a level of development high enough to prevent them from competing on the same grounds with low income countries (e.g. labour costs); but at the same time, they still lack the fine-tuned institutional and factor endowment mix that would allow them to compete in knowledge intensive products, typical of high income economies. As a result, many of the countries that have reached middle income status have been unable to continue the process of income convergence with rich economies, in a process that has come to be known as the Middle Income Trap. Most of the countries that successfully transitioned from middle to high income levels are in Europe and Asia, whereas Latin America has not been able to surpass the Middle Income Trap. If we consider the second half of the 20th century, the countries that have dodged the trap are essentially a set of European countries (Spain, Ireland, Finland, Portugal, Greece etc. ); Australia, New Zealand, GCC oil exporters, and a few Asian economies (Japan and the Asian Newly Industrialized Countries, NICs). In contrast, while many Latin American countries had already reached middle income levels by 1950, the region hosts no examples of transitions to the rich income club. 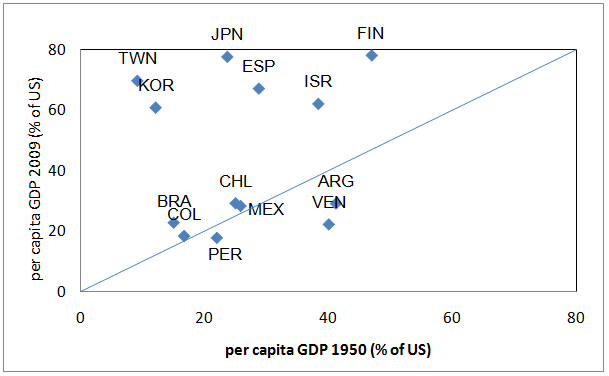 To illustrate this point, Figure 1 plots the per capita income levels in 1950 and 2009 for the largest Latin American economies, as well as a sample of countries that have reached high income levels. Instead of choosing a monetary threshold for both years, we include per capita income as the percentage of that in the United States, to proxy for a representative high income economy. This relative income framework highlights Latin America’s difficulties in achieving income convergence. Against the previous record, the sample of European and Asian countries under consideration drastically reduced their relative income gap with the United States, chopping an average of 42 percentage points between 1950 and 2009. This performance reaches unparalleled proportions in the case of Korea (KOR) and Chinese Taipei (TWN), both with an initial income lower than Brazil, yet reducing the gap with the income of the United States by 49 and 68 percentage points, respectively. Figure1. Per capita GDP (in PPP $) in 1950 and 2009 (as % of U.S. per cap GDP). The East Asian NICs recipe for income convergence: gradual upgrading towards higher value industries. Figure 1 places Latin America and the Asian NICs at opposite extremes of the experience with the Middle Income Trap. The experience of the Asian NICs suggests that escaping the Middle Income Trap requires a process of structural transformation through diversification into higher value-added products. Based on the Product Space methodology (Hidalgo et al., 2007), which maps the relative proximity or similarity of traded products, we conducted a study (Jankowska, Nagengast & Perea, 2012) to identify and characterise some features of this transformation. We show that in the case of the Asian NICs, structural transformation was a gradual process. New production was sequentially developed in industries (e.g., iron, steel, machinery and electronics) using skills and capabilities transferable with relative ease from existing industries. This strategic increase in high “connectivity” sectors allowed undertaking a gradual yet systematic transition towards higher value added activities, especially those requiring similar technology and production techniques. By contrast, Latin American countries tend to be characterised by economic specializations in industries that are relatively “far” from high value-added industries, leading to lower connectivity on their export profiles (see Figure 2 below). Part of this divergence in ability to upgrade their export structure has to do with relative levels of productive capabilities or the specific skills and inputs available, which have been shown to be predictive of future GDP growth (Hidalgo and Hausmann, 2009). Latin American countries, with the exception of Brazil and Mexico, show capabilities that tend to be below the global average, whereas the Asian NICs already had high values in the 1960s and have since then reached values substantially above the global average. These differences in productive capabilities highlight the importance of complimentary policies in facilitating economic transformation. Note: The Product Space methodology provides a map of all traded goods displaying relative proximity or similarity between products. The colours on the map represent the Leamer classification which categorizes products according to labour, capital and other resource intensiveness. The black squares indicate products in which the country has a revealed comparative advantage. Successful transitions to higher value industries are not only a consequence of a “favourable position” in the Product Space. An adequate mix of policies is essential. Korea is an illustrative example of how the Asian NICs put in place policies to support diversification and productive upgrading. Its capacity to benefit from trade-led growth in high connectivity and value-added sectors relied heavily on implementing the right combination of productive and complimentary policies. As Korea moved through successive Five Year Plans for economic development beginning in the 1960s, its productive development policies targeted light manufacturing; then heavy chemicals, iron and steel; followed by shipbuilding and heavy machinery; and then electronics and knowledge-intensive industries. Throughout these productive phases, Korea aligned complimentary policies to meet particular industry needs. For example, in education policy, Korea initially focused on primary education during the light manufacturing phase, and invested more heavily in secondary education and technical training to provide skills for heavier industries, and shifted towards higher education with the subsequent move into electronics and knowledge-intensive industries. Similar trends of adapting complimentary policies to specific industry needs were visible in the areas of financing, with credit directed towards target industries, as well as innovation policies, providing fiscal incentives for the creation of R&D centres, and venture capital for high-tech start ups. This policy alignment was critical for providing the necessary skilled labour to move into higher value-added industries, assuring sufficient capital to develop productive capacities, as well as supporting research and innovation in more knowledge-intensive sectors. For Latin America and other countries currently in the middle income zone, the Korean experience underscores the importance of supporting productive development with the appropriate complimentary policies, particularly in order to facilitate the gradual and path-dependent economic transformation necessary for income convergence. HIDALGO, C. A., B. KLINGER, A.L. BARABÁSI, and R. HAUSMANN (2007). "The Product Space Conditions the Development of Nations." Science, 317(5837), 482 –487. HIDALGO, A. C. and R. HAUSMANN (2009). "The building blocks of economic complexity." Proceedings of the National Academy of Sciences, 106(26), 10570 –10575. JANKOWSKA, A., A. J. NAGENGAST and J. R. PEREA (2012). “The Product Space and the Middle Income Trap: Comparing Asian and Latin American Experiences”, OECD Development Centre Working Paper No. 311. OECD DEVELOPMENT CENTRE (2010). Perspectives on Global Development.